I am a bit annoyed at myself for getting behind with the last few bump updates! As I write this it is two days after Christmas and I am currently 39 weeks and 2 days. But with all the excitement and rushing around which comes at Christmas time, I have felt so exhausted and not really felt much like writing. I am hoping we will have a quiet few days ahead of us now as I really feel baby won't come unless I am feeling refreshed and relaxed, not running around worrying about wrapping presents, last minute Christmas shopping (yep, I still managed to leave loads till the last minute despite promising myself I'd get it all done by the end of November!). 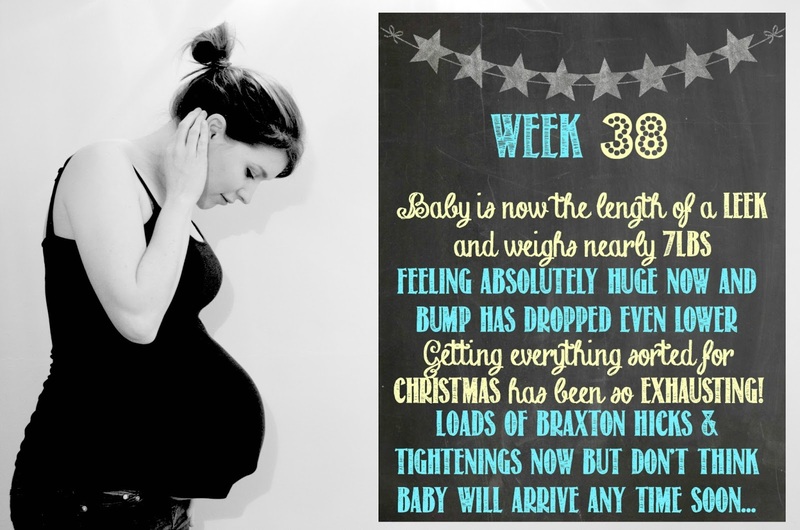 I spoke in my last bump update about seeing the midwife which was about 2 weeks ago now. She said his head wasn't engaged, so I am interested to see if it is now as I have been getting so much pressure and a lot of Braxton Hicks. His movements have become less like kicks and more like shuffles or wriggles and even though I've experienced this before with LO, it still never ceases to astound and amaze me when I see him moving under my skin! I really need to get on and finish packing my hospital bag as I put it together in a bit of a hurry and never really checked what I'd thrown in. My NCT friends gave me a lovely bag of mummy/baby gifts and I shall definitely be putting some of those in the bag as they'll come in so handy. Maternity clothes? I am totally in love with my new clothes from the Maternity range at George @ Asda which I did a post on. I selected really versatile pieces and have basically lived in those along with leggings and maternity jeans. I can highly recommend checking out the range. Stretch marks? Although my skin looks in a bad way, it's almost as if it's now numb and I can't really feel it. Sleep: Not good at all. I'm finding I'm awake for 2 hours in the middle of the night and then wake with a sore throat. Best moment this week: I can't remember! Wedding rings on or off: On. My fingers have actually got smaller I think?! Looking forward to: Meeting little man!